(a) UMBC ELF aerosol lidar time series from 09 June 2015 at 3:40p.m. (15:40) EST to 10 June 2015 at 10:28 a.m. EST. ; (b) Scattering coefficient and extinction from the corresponding times in (a) at HUB and UMBC, respectively; and (c) Hourly averaged fine particle (PM2.5) concentrations for all Maryland monitoring sites for the same time in (a) showing the subsiding signature captured by the ELF was associated with rising particle counts. Air quality forecasts and attainment projections rely upon semi-empirical parameterizations within numerical models for the description of dispersion, formation and fate of pollutants influenced by the spatial and temporal distribution of emissions in cities, the topography, and weather. The particulate matter (PM) mass measured at the ground level is a common way to quantify the amount of aerosol particles in the atmosphere and is used as a standard to evaluate air quality. PM forecasting needs a thorough understanding of the processes affecting aerosol concentrations as well as vertically-resolved measurements in the atmospheric column. Lidar measurements at the UMBC have supported local agencies such as Maryland Department of the Environment (MDE) Air Quality Monitoring Program to determine the relative impact of long-range transport versus local emissions during nocturnal low level jet (NLLJ) and wintertime pollution events over the Baltimore-Washington region. These efforts have aided the MDE to identify local sources and long range transport of pollutants that affect the state of Maryland, gain insight into interstate transport and direct policy decisions towards fair and equitable emission control strategies. Lidar activities are key support component of the National Oceanic and Atmospheric Administration (NOAA) Cooperative Remote Sensing Science and Technology Center (CREST) Lidar Network activities to monitor and study regional and urban air quality in eastern United States. UMBC lidar activities in the CREST Lidar Network (CLN) fall within the NOAA CREST Air and Weather Research Theme, specifically within Project 2: “Aerosol, Water Vapor, and Planetary Boundary Layer Climatology with the CREST Lidar Network (CLN) in support of satellite product validation and applications to air quality”. This work contributes to NOAA’s “Weather Ready Nation” goal and addresses the following objectives within this goal: 1) “Healthy people and communities through improved air and water quality”, and 2) “Reduced loss of life, property, and disruption from high-impact events”. Lidar provides high resolution information on the altitude dependence of troposphere aerosols and water vapor, providing precise measurements in regions of the lower atmosphere above a city, which would inaccessible to either aircraft or tethered balloons. 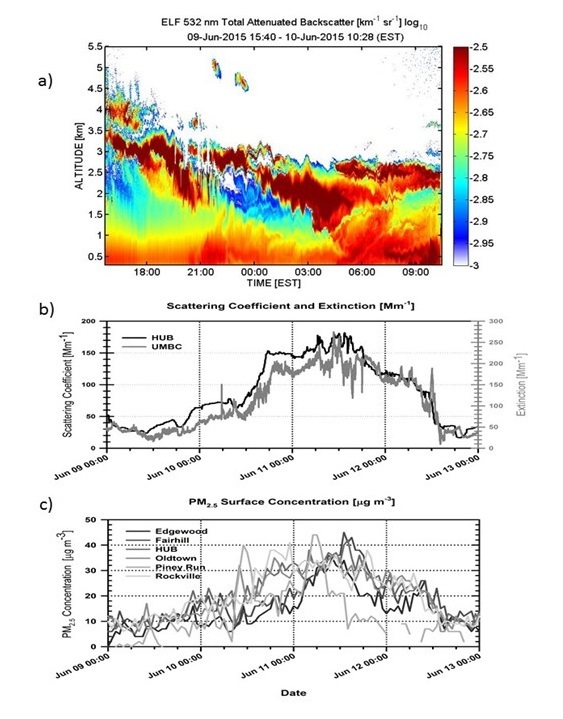 Retrieved aerosol backscatter and extinction are used to derive variations of the atmospheric structure and transport, gaining knowledge of aerosol radiative properties needed to evaluate aerosol effects on climate and air quality. These measurements provide insight into the planetary boundary layer (PBL) temporal structure, height and variability. Regarding air quality, the PBL height determines the volume available for pollutant dispersion and the resulting concentrations and is therefore one of the fundamental parameters in many dispersion models. UMBC lidar observations when used in conjunction with satellite data can be assimilated into forecasting models to reproduce current distributions of aerosols and oxidants in urban areas and to improve their accuracy in forecasting air quality and understanding regional pollution dynamics. Also, provides ground truth for satellite retrieval over areas with high surface albedo, allowing instrument accuracy assessments of regional water vapor and aerosol variability.